Muntjac tend to be most active and sighted at dawn and dusk, but can be seen at all times of the day. Calling adds a new dimension to stalking deer; using the whole day effectively for hunting Muntjac, also offering the best light for filming and photography. Nice weather, when pleasant to be out and about seems to bring the best results, but rain makes no real difference. Calling at any time of day can be successful but the most dramatic results seem to be as evening draws near. Position is important – downwind of the deer with a good solid background like a bush or tree trunk to mask any movements made by the Caller or companions. 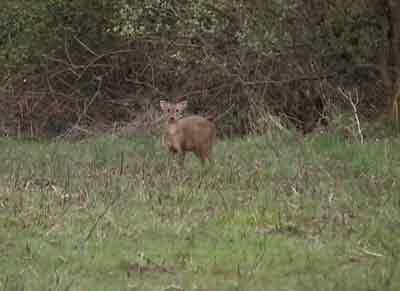 Muntjac can often be attracted to a hidden caller by sucking/blowing/squeezing on a Roe call. Calling can often be quite dramatic with the animals approaching quite closely. You can usually see a deer within five minutes and from then on you are being stalked! Sometimes barking is triggered by the call and this makes things easier, but you must remain vigilant as you are often stalked by several Muntjac at the same time. The deer are concentrating upon you most intently and any false move will cause them to run away. However, if you continue the calling they often circle amongst the nearest cover. Saw my first ‘wild’ muntjac today on the Lickey Hills south of Birmingham. I say first but it was three, two adults and one fawn. The wind was behind me so they were gone in a flash. I must try one of those whistle jobies and see if I can get a photo or two. Today on my way home, I saw a Muntjac on the side of the road; it had been hit. We turned around and the poor thing didn’t stand a chance, and the sound it was making sounded like crying. A farmer stopped to ‘put it out of it’s misery’. It was very sad, and now I would like to try this ‘calling’ so I can take a few pictures of them, they are such beautiful animals and should be appreciated more often. Will give it a try & see if I can post pics on here. As a result of reading your site I bought a buttolo roe call. Yesterday evening I gave it ago. Wow!!!! within 10 mins. a muntjac buck appeard about 40 feet from me across the river, followed by another barking one ,which came even closer . A doe appeared about 100 yards from me, and stayed for 15 mins. Did the same this evening on another plot, again I was only checking out my hide and was pushed for time. called for about 10 mins, with no result. As I was walking back to my car, bumped a buck about 50 yard from where I was calling, so yes it worked. Thanks for the site and the advice it gives.